When it comes to purchasing or building an aircraft hanger, there are several factors that are very important. Anyone that is investing in this expensive profession will want to make sure that when it is time to operate that everything is in working condition in the hanger. You also need to figure out the size, dimensions and design that you are looking for. The aircraft or aircraft’s will need room to be stored in the hanger, any working areas, office areas, ect. You will want to make sure that your office is running up to its expectation by the opening day of your hanger. 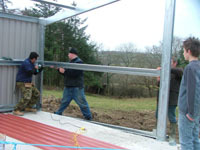 This entry was posted in Steel Buildings and tagged aircraft, area, buildings, hanger, measurements, pembs, steel by admin. Bookmark the permalink.